How do I get a place for the nursery? We recommend you download an information pack and if you like what you read phone Lisa or Leanne to make an appointment to come visit us. If you like what we do we would then recommend filling in a registration / booking form. How soon do I need to book a nursery place? Due to high demand for places we recommend that you register with us approximately 6-9months prior to wanting a place. This generally allows for maximum choice of days you would like your child to attend. A £50 retainer is required when booking a place to guarantee the place, this is deducted from the first months fees. How do I book my introductory sessions? Approximately 4 weeks prior to the commencement day Lisa or Leanne will call you to arrange introductory sessions. 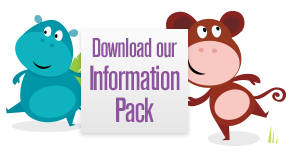 These are free of charge and allow you to share information with us and your child to explore their new surroundings. These introductory sessions are 2 x 2 hours and 1 x 3 hours. What should I bring with me for my child? If your child is in nappies you need to supply the nursery with nappies and wipes and any cream you use whilst changing a nappy, nappies are changed a minimum of 3 times per day as well as on demand. A change of clothes is essential all the way through nursery and if children are toilet training we recommend lots of changes of underwear. If your child has a comforter or dummy they generally have throughout the day you should bring these along. What food and drink do I need to bring? You need to supply formula if your child is still having a formula bottle, if your child drinks cows / soya milk we supply this. All meals are provided once your child is weaned onto vegetable purees, however if they require baby rice we ask you to supply this. Fees are due 1st monthly in advance or if starting after the first of the month they are due within a week of commencement. Payment can be made by standing order, cheque or cash and we accept a wide variety of childcare vouchers, to see if you can claim tax credits or childcare vouchers use the link below to the HMRC website: http://www.hmrc.gov.uk/calcs/ccin.htm. Excellent! I'm confident my daughter is well looked after whilst we are at work.  I would not hesitate in recommending Maple Lodge to anyone.